The nice weather continued into the weekend, which made me super happy! Friday night I went swimming and then we ate a delicious dinner of blackened ahi tuna and brussels sprouts. After dinner we took Bella for a walk in the neighborhood. Trees were blooming, flowers were everywhere, the air smelled fresh and like spring. I love it when evenings get longer and the sunset is slower. Saturday I woke up to more nice weather and decided to skip the gym and go for a hike. Michael and I went to breakfast first–at The Bomber. 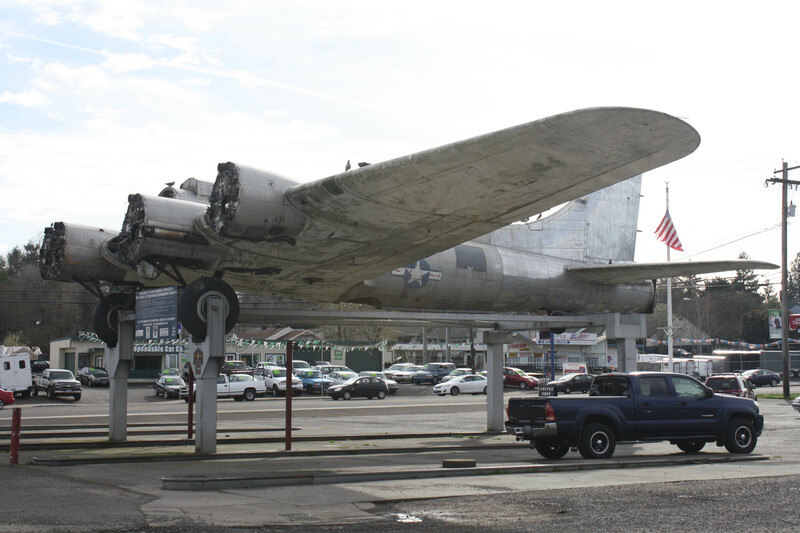 I’ve never been but have driven by it many times and have been curious about the huge fighter plane in the parking lot: I think we were the youngest people in the restaurant, but who cares? Inside there were a lot of World War II memorbilia–a machine gun mounted on the all, photos, newspaper clippings, etc. They had a section of the menu with smaller portions–which made me happy! 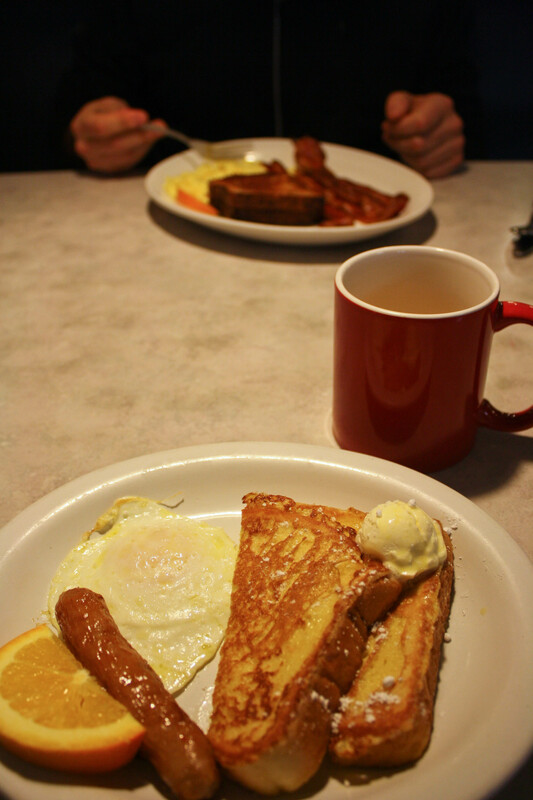 I got the small plate with one egg, one sausage link and one piece of French Toast. I had a lot of coffee, too. The French toast was tasty. It was just the right amount of food for me. Michael got scrambled eggs and bacon and toast–which was gluten free. It’s awesome that they had that option for him. 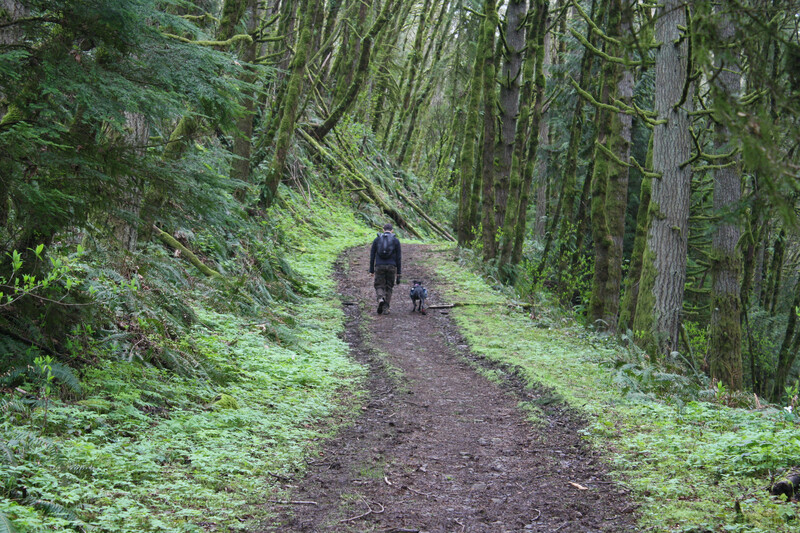 After breakfast we headed west towards Forest Park on Highway 30 (St. Helens). 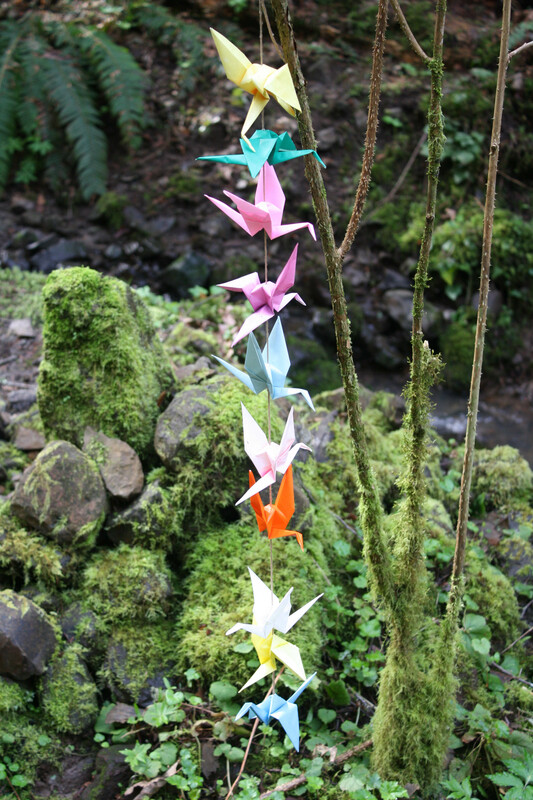 I had suggested we do a hike in Forest Park (which is a huge park in Portland and part of Washington Park which includes the Japanese Gardens and the Rose Gardens). I found a hike online and we were able to locate the trailhead pretty easily even though the directions were vague. I had used this website for ideas on hikes. 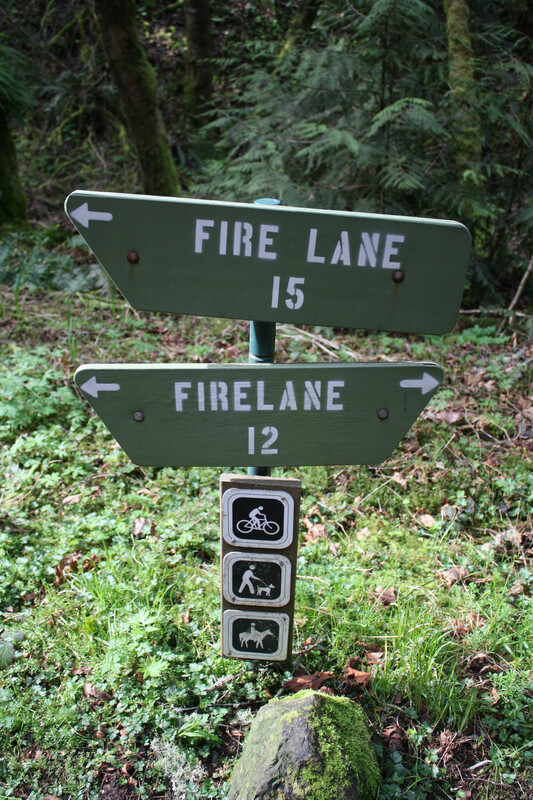 We did the Firelane 12/15 Hike. 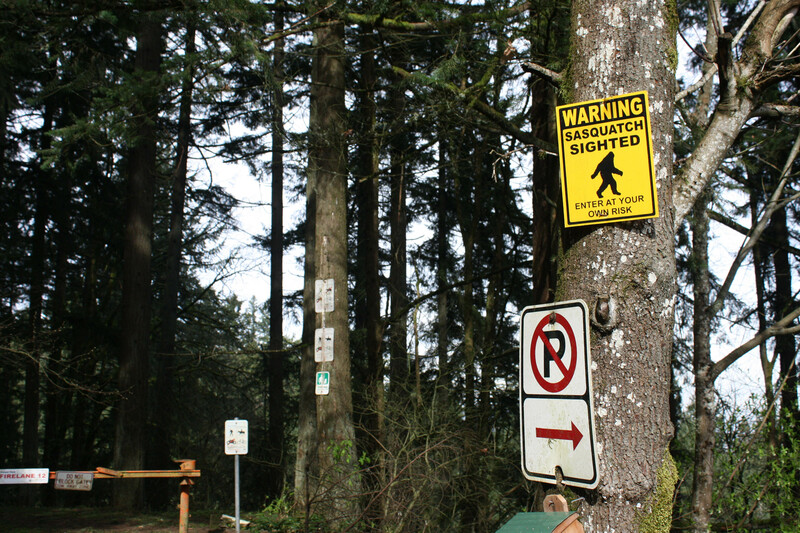 It was an old fire road through the old growth forest and the trailhead starts at a dead end street next to residential houses. It was somewhat odd parking in front of someone else’s house, but there were a few shoulders that were wide enough to park on. Bella’s paw got re-injured last weekend. Thankfully it was a mild cut and we’ve been treating it for the last week. Just to be safe she wore a bootie on the paw. She walks much better with only one bootie on. 🙂 Michael bought a dog “backpack.” It’s got two saddle bags that are big enough to hold some snacks, poo bags, and her travel water dish. It wasn’t too heavy or anything and she didn’t seem too bothered by it. The trail was deceptive. At first I thought it was going to be a super easy hike but then the road started to climb. There were at least half a dozen VERY steep parts to the road. 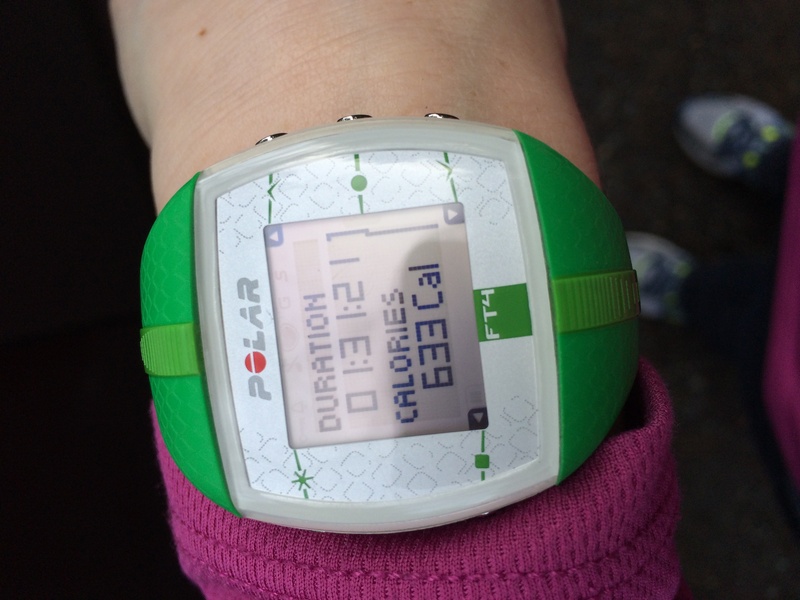 My heart rate got very high on those hills. It was cool to see the little altar and origami! It was next to the babbling creek that we’d heard for about 3/4 of a mile but couldn’t see until the trail headed downhill. After the creek we came to fork in the road. 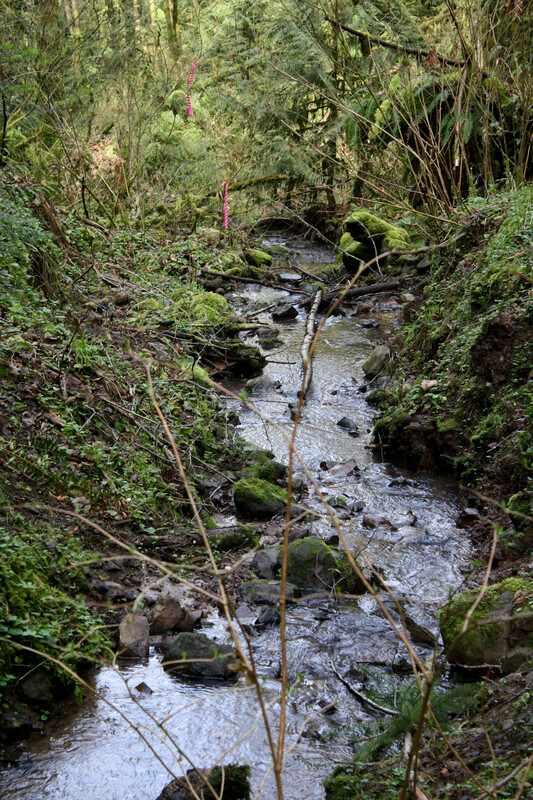 The trail split to Firelane 12 or Firelane 15. I wasn’t sure if the trails connected anywhere further down the path. We decided to take Firelane 15 because it wrapped around the creek and then the trail went back up and it looked like there was sunshine on that route. 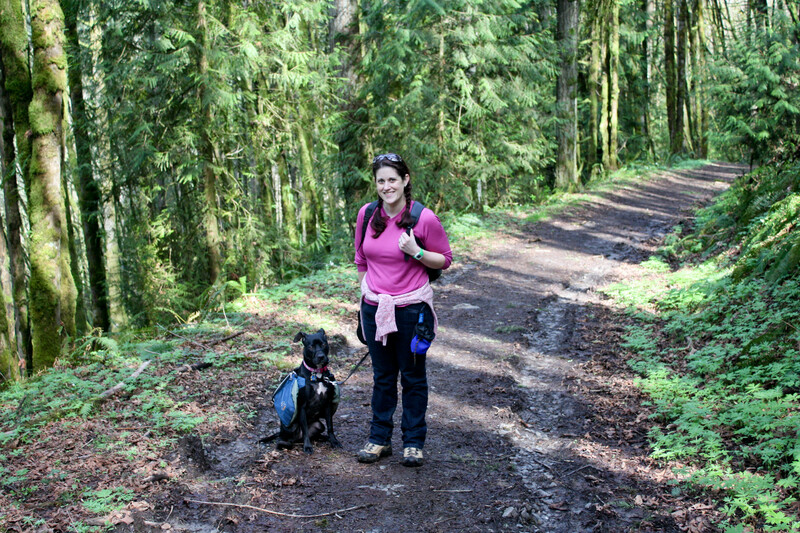 We stopped here for a water break for us and Bella. Firelane 15 was ALL uphill. We wrapped around the side of the hill and then there was another break in the trees. About 1/4 mile later we came to another fork in the road. 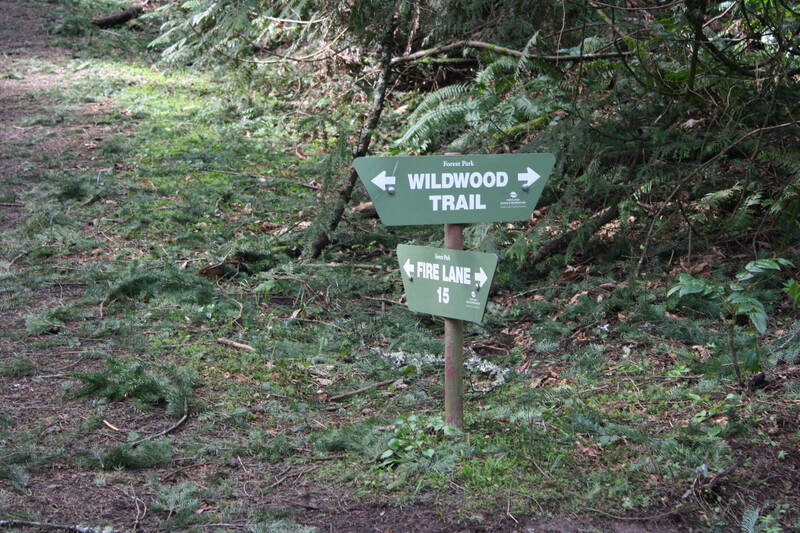 The fire roads connected to the Wildwood Trail that is one of the most popular trails in Forest Park. 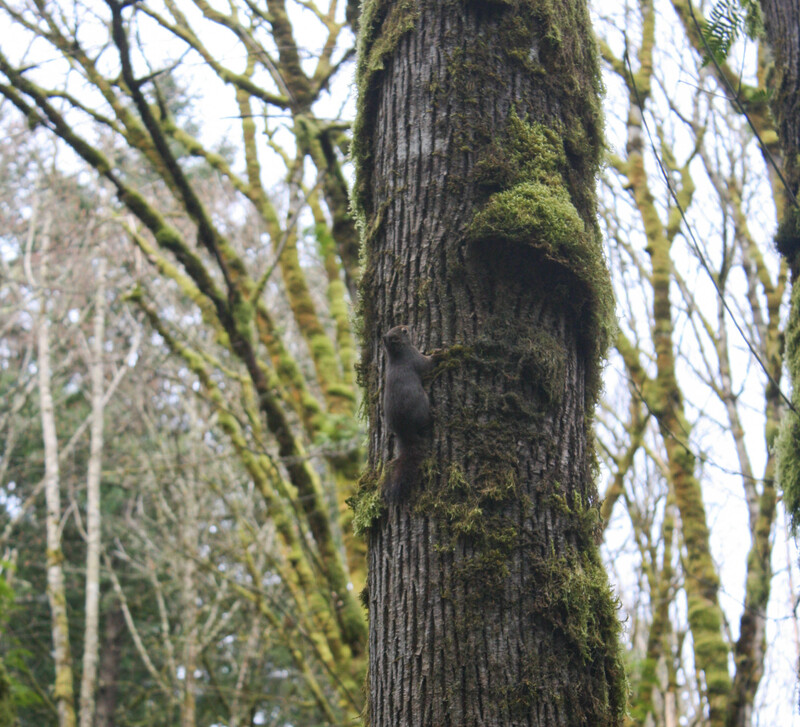 It might also be super long because we were at least 10-15 miles away from Hoyt Arboretum where Wildwood starts. 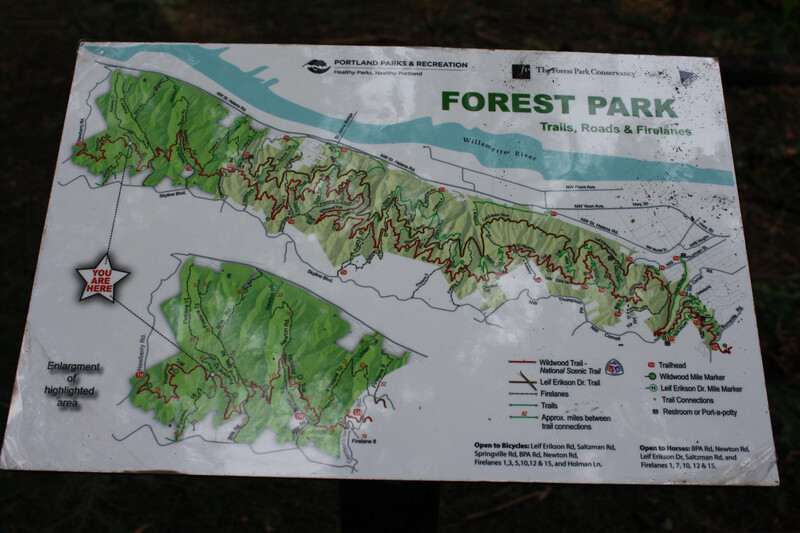 There was also a map of Forest Park trails but after much investigation and debate, we still couldn’t figure out if 15 connected to 12 in a loop. We decided to turn around and go back the same way we came. That was a good decision. The rest of the day was pretty busy. Michael was meeting some friends and I cleaned the house, did laundry and met some friends at the dog park for a little bit. I was really really ready for my PJs and Netflix by the time the day was done! The Bomber sounds cool. That altar is interesting. 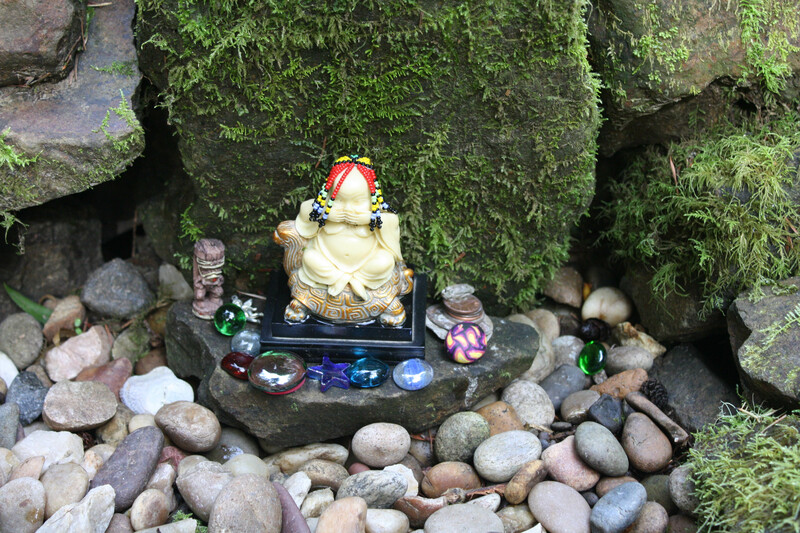 I like stumbling across stuff like that on hikes. I do too. We haven’t seen something like that on a hike in ages. 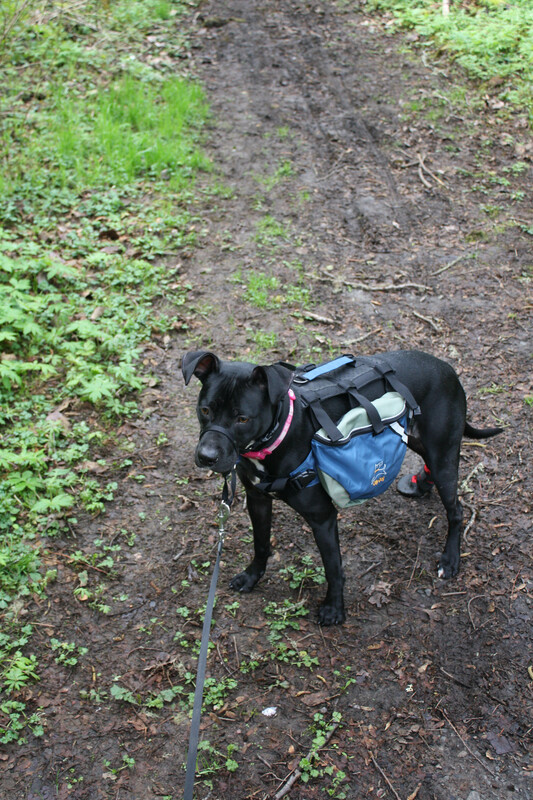 I’ve never seen a doggie back pack like that before – so cool! What a great way to spend outdoors – I am dreaming of spring like weather – it was 14 degrees when I left the house this morning! Biz recently posted..I see drunk people. It is a nifty little invention. It’s not heavy at all. The only problem was that Bella is in between sizes–a small is too small and a medium is a little too big. Hahaha. Bella is so adorable with her saddle bags. Thanks! I think the saddle bags make her look super tiny. 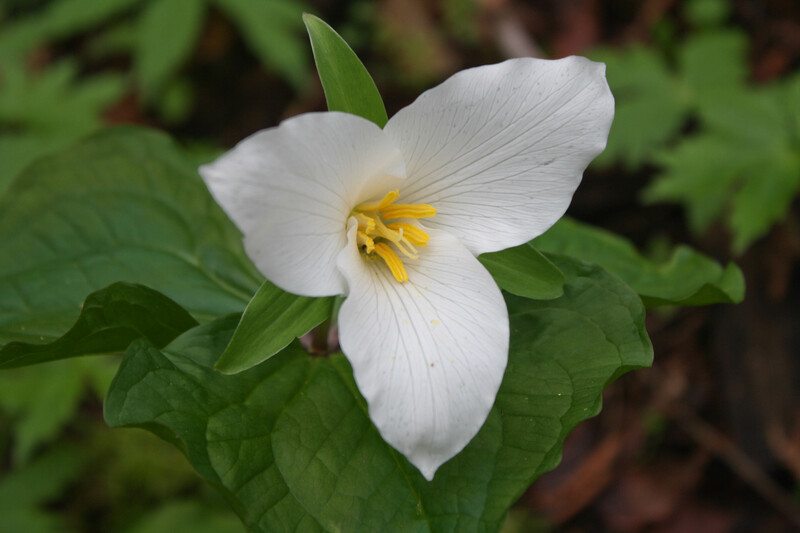 Yay, trillium! I saw my first ones of the season last week and literally squealed and jumped for joy. Spring is here! Have you tried using poles on the downhills? They’re very helpful to take the pressure off your joints, it’s great for knee problems. I’ve never hiked with poles but would be willing to try. Anything that helps! My shins are so sore today. How does having the poles effect your photography? Do you just drop the poles every time you want to take a picture? I put the straps around my wrists and let the poles dangle while I take a photo. It’s kind of annoying, but better than painful knees! Last summer I mostly stopped using them (except for backpacking/snow/more than 4000 feet descent) because I started running the downhills instead of walking, which actually feels better on my joints than walking the entire way. Wearing trail runners instead of boots feels so much better to me too, but I know not everyone is comfortable with that while hiking. Interesting! I wonder if trail running shoes would work for me…..
That is a beautiful hike. Bella looks very happy and everything is so green!! Sounds & looks like a very nice hike. My knees don’t do well on steep downhill parts either. Glad you were okay. OMGOSH HOW FLIPPING CUTE IS BOOTIEBELLA!!! Carla recently posted..Twitter chat 101. Haha! She is so funny in those booties! I LOVE your hike pictures! Thanks for sharing Lisa. (really love the alter and origami!) Have a wonderful day! Roz@weightingfor50 recently posted..Duck of the Irish…. It was cool stumbling upon the altar. Very unexpected. That doggy backpack is awesome!!! I have never been big on hiking but I think if I had places like your trail to hike through I would enjoy it – gorgeous!!! 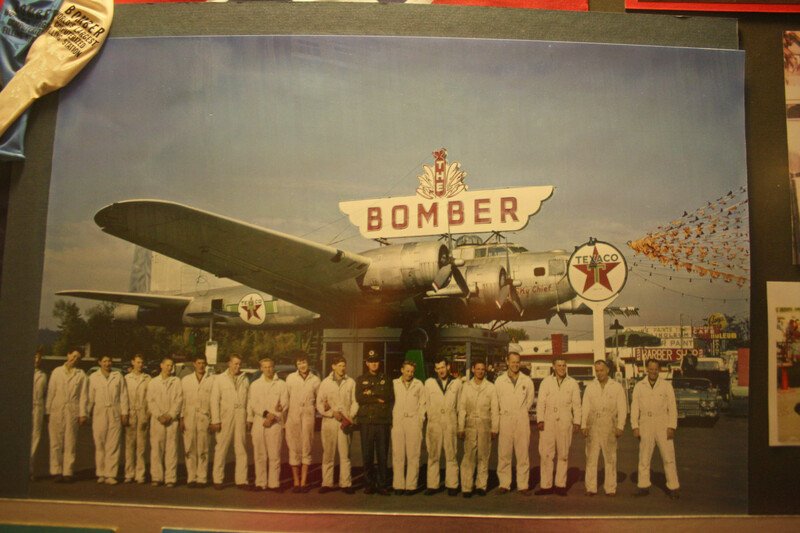 And, my husband would love that little Bomber place!! 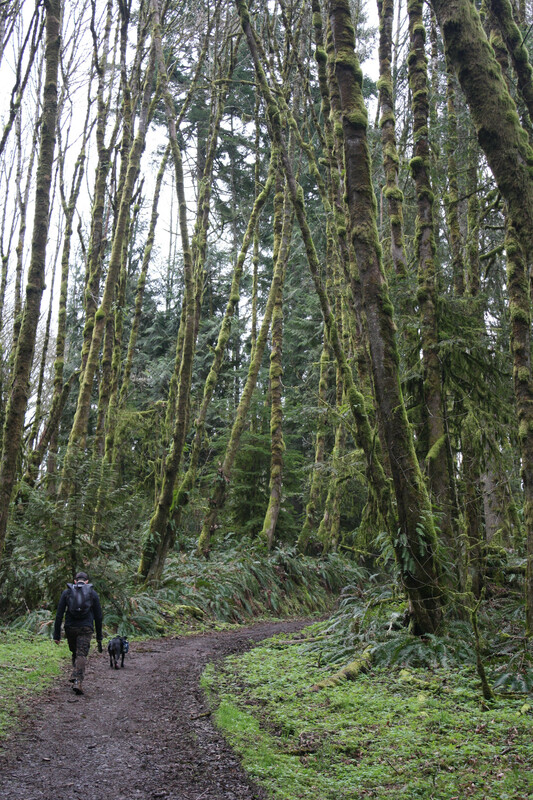 There are so many great hikes in Oregon!